Your wedding day. It can be one of the happiest – and most expensive – days of your life. So just where is all that money going? Let’s just say most of it isn’t going toward the groom’s tux or paying the officiant for the ceremony. Major expenses tended to come in for the reception – where many brides and grooms hope to create a special event for their friends and family. Were you surprised by any of the costs? If you’re in Manhattan, those prices may have looked pretty good – especially when you consider that the average cost of a wedding there is $76,328. Of course, if you’re planning a wedding in Utah (where the average wedding celebration came in much lower at $15,257) you might have gotten a bit of sticker shock. Wedding Prices Keep Climbing. But Many Budgets Aren’t Keeping Up. 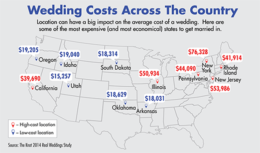 The Knot reports that wedding costs continue to go up. In fact, the 2014 average wedding bill was $1,355 higher than the total from just one year ago. Unfortunately, budgets aren’t keeping up with those bills. According to The Knot’s survey, a full 45% of couples went over their wedding budget. So what’s a financially savvy way to pay for such big expenses? If you’re just starting a life together, you probably don’t have that kind of money sitting out there in a savings account. But putting everything on credit cards can saddle new couples with significant amounts of higher-interest debt. That’s where a personal loan can be a smart solution. You could use a personal loan for your wedding (often called a wedding loan) to take care of the big bills while saving significant amounts of money with the low, fixed interest rates currently available. Thousands of brides and grooms (and their parents) have turned to wedding loans to help pay for the big day they’ve always wanted. In addition to low, fixed interest rates, there are several other advantages to this option. With a personal loan, there’s no collateral required. That means no concerns about putting up a house, your car or another asset as a promise to repay. Plus, you can set up fixed payments for an amount of time that fits both your budget and your current financial situation. For example, wedding loans from Discover Personal Loans give you flexible options ranging from 36 months all the way to 84 months. See what that can mean for your monthly payment. In addition, there are no pre-payment penalties so you’re free to pay off the wedding loan as quickly as you want. Using a loan for your wedding can help you and your family relax and refocus on your special day – without worrying quite so much when the bills arrive. After all, who wants to spend their big day thinking about how much everything costs? 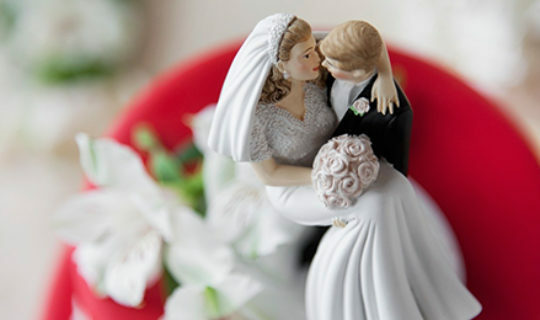 So if wedding bells are ringing in your future, it’s a smart choice to figure out what you’re wanting for your big day. Then, once you know the “must haves” for your wedding, you can put together a budget so you and your family can accurately plan for how you’ll pay the costs for your wedding celebration.